National Weather Service provided the above graphic in a weather update on Jan. 19, 2019. After several days of anticipation, the day of the snowstorm is finally here. By 7:45 p.m., some areas of Connecticut were starting to see snow. The length of the storm is expected to be shorter than initially anticipated and the total snowfall is expected to fall below what meteorologists were predicting a few days ago. A winter weather advisory was still in effect for most of the state through 10 a.m. Sunday, according to the National Weather Service. The service estimated 4 to 8 inches of snow and sleet for much of the northern part of the state and 1 to 4 inches for most of southern Connecticut. Officials are asking residents to stay off the roads during the storm if possible. Below is the most up-to-date information being shared by towns and cities statewide. A few minor fender benders and spin-outs being reported across Fairfield County on the highways, according to Connecticut State Police dispatch reports. Gov. Ned Lamont said statewide and local agencies were prepared for whatever the snowstorm brings. “I feel very confident that we’re ready for this,” Lamont said during a winter storm briefing at the Emergency Operations Center in Hartford. Forecasts had called for precipitation to begin late Saturday afternoon and to continue into Sunday. By Saturday night, those forecasts had drastically changed. With the delay in snowfall, expected accumulations were also reduced. Lamont said ice was a major concern. “Ice is dangerous on roads; ice takes down power lines,” he said. The weather service reiterated that point, saying travel Saturday night into Sunday night would be difficult and potentially dangerous. “Be cautious and stay home, if you can,” Lamont said, adding that having fewer civilian vehicles on the road helps crews clear snow more efficiently. Though there was a truck and bus ban for most major highways in New York, Lamont said Connecticut would not follow suit. He said the state’s Department of Transportation had 631 plows ready statewide to clear the roads. Earlier in the week, DOT said crews pre-treated problematic roadways across Connecticut. Since the storm was expected to bring snow, sleet, freezing rain, rain and wind to the state, flooding was also a concern along the coast, Lamont said. “Flooding followed by bitterly cold temperatures,” would likely lead to areas of severe icing, he said. With the winds expected, Lamont said, there was the possibility for power outages. But, he said, the utility companies were monitoring the storm. Snow is slowly starting to fall in the city, which remains under a level one snow emergency. During the storm, public works crews will work efficiently to clear all roads, beginning with major streets and connecting roads before clearing less traveled neighborhood roads. Residents are reminded it can take up to eight hours after the snow stops to clear all roads in East Hartford. During the storm, emergency services will have access to all areas of town and be in communication with town plows as needed. After all 150 miles of road in town get an initial pass, additional plow passes are made to clear every road from curb to curb. State-owned roads — such as Burnside Avenue, Main Street and Silver Lane — are plowed by the state Department of Transportation. Property owners must clear sidewalks of snow, ice, sleet or debris within 8 hours after sunrise during a storm. A parking ban is in effect for the town as well. The NWS released an updated report on the incoming snowstorm Saturday night. 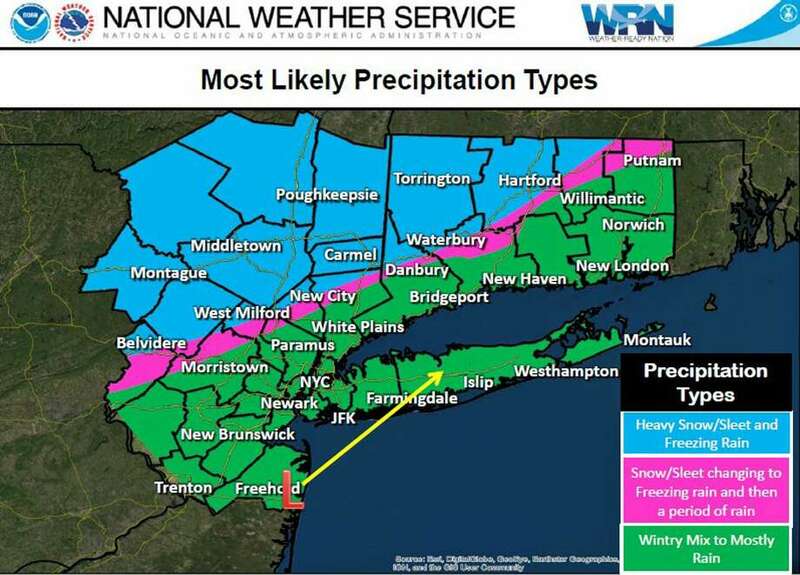 Snow and sleet accumulations of 4 to 8 inches possible for northern Fairfield County. Travel will be dangerous. Southwest Connecticut should expect to seen between 1 and 4 inches of snow, with a rate of half an inch to one inch per hour Saturday night. Travel will be difficult. Some airlines started changing their schedules earlier Saturday and more adjustments were made throughout the afternoon to the evening schedules. There are various canceled flights, primarily arrivals, because of the predicted weather conditions. Those scheduled to travel Saturday night or Sunday are urged to check with their airline on their individual flight itineraries. Several airlines have put travel waivers in place. Real-time flight updates are available at www.flybdl.org. Twitter users can be automated updates by tweeting their flight number to @BDLFlightInfo. Late Friday night, Gov. Andrew Cuomo of New York announced a bus and tractor trailer ban. The ban is across the entire thruway system in New York and most interstate highways. The only exceptions will be Interstate 95 in Westchester and Bronx counties. The ban began at 3 p.m. Saturday and is expected to last through the duration of the storm. Mayor Daniel Drew declared a parking ban starting at 6 p.m. Saturday. The ban requires residents to remove their cars from city streets. Any vehicles on city streets must be removed by 6 p.m. to run the risk of getting ticketed for $100 per violation and/or towed. Police will be enforcing a winter parking ban for the duration of the store, according to police Lt. Michael Durkee. The city’s planned parking ban has been canceled because of the change in forecast predictions. The town of North Haven issued a parking ban beginning 6 p.m. Saturday and ending at noon Sunday, according to Deputy Police Chief Kevin Glenn. A parking ban is in effect, meaning no parking on any town road at any time during the storm. A Danbury CT Alert from Mayor Mark Boughton said the Danbury area is expecting 4 to 6 inches of snowfall Saturday night before it changes over to freezing perception overnight. A level one snow emergency goes into effect at 5 p.m. The NWS is expected to see snow, freezing rain and sleet before 3 a.m. Sunday. Then, freezing rain will come in between 3 a.m. and 4 a.m. Sunday, then rain after 4 a.m. The new estimated accumulation of ice is between 0.1 to 0.3 of an inch. New snow and sleet accumulation of 3 to 5 inches. The total daytime snow accumulation for the Torrington area is less than half an inch. Snow and sleet are expected before 3 a.m. Sunday, then sleet between 3 a.m. and 4 a.m., followed by freezing rain. An accumulation of 0.1 to 0.3 of an inch of ice is possible. The new estimated total amount of snow for the area is between 3 to 7 inches. Additional snow accumulation Sunday is 1 to 2 inches for the Torrington area. Scott Appleby, director of emergency management and homeland security in the city, said the winter storm watch was downgraded to a winter weather advisory. "What this means is there still is a potential for a wintry precipitation with ice due to the forecast," Appleby said Saturday. "However, the duration of the storm will not be as long and the snow rates, although still in the 3 to 5-inch range, can be lower if the track stays its course." The city issued a snow emergency for Saturday, something that is usually reserved for when 6 inches of snow or more are expected. Appleby said an exception was made for this storm because of the ice that’s forecast to accompany the snowstorm. "As always, (it’s) a complex storm," he said, "but we are keeping a close eye on it." The town’s fire department urges residents to keep portable generators outside if they lose power and are trying to keep warm. "Don’t back-feed into your service panel," officials warned. "Electricity feeding back to the grid puts line workers at risk." The warming center will be open at Grace & St. Peter’s Episcopal church at 2927 Dixwell Ave. from 9 p.m. Saturday through 7 a.m. Tuesday. The New Fairfield Volunteer Fire Department said it’s prepared for the upcoming storm. "Members of each firehouse have checked each piece of equipment and fire trucks have been fueled," officials said. Snow chains have been added the tires of each rig. Officials said members are, "ready to go." The NFVFD is asking residents not to travel Saturday night and Sunday as a precaution. Mayor Toni Harp said the city departments and workers are prepared for the impact the storm is forecast to have when it hits Saturday into Sunday. A parking ban is in effect downtown, on posted snow emergency routes and all residential areas as of midnight Sunday. No parking is allowed on either side of the street in downtown and on snow emergency routes. No odd side of the street parking is allowed in residential areas. Parking is prohibited 25 feet from any fire hydrant, intersection, bus stop or crosswalk. Off-street parking should be utilized wherever possible. New Haven Public Schools parking lots are available to residents. More than 40 snow-plowing vehicles are standing by awaiting the storm. Those vehicles will clear the city’s 221 miles of roadway - including 818 individuals streets and roads, many of which have been pre-treated with a de-icing solution or brine. Residents are encouraged to help with snow-clearing and public safety efforts by digging out fire hydrants near their homes to ensure they’re accessible in case of any emergency. All property owners are responsible for clearing sidewalks along their property within 24 hours after the end of a storm. The city will have the Grand Avenue warming center open from 6 p.m. Saturday through 10 a.m. Wednesday. The city’s designated overnight shelters will operate with extended hours. City residents are urged to take precaution as the storm approaches, set to bring cold weather, wind, snow and more. Most importantly, city officials are encouraging residents to be aware of the frigid temperatures expected to follow the storm. "The cold weather can increase the potential for frozen/burst pipes, heating-related accidents, fires and other cold weather impacts," officials said. To prevent frozen pipes, open cabinet doors to let warm air circulate around water pipes. "Let the cold water drip from the faucet served by exposed pipes," officials said. "Running water through the pipe - even at a trickle - helps prevent pipes from freezing because the temperature of the running water through it is above freezing." Thermostats should be set at a consistent temperature. Frozen pipes or meters should never be thawed with an open flame; this could cause a fire or a steam explosion. Any space heaters should be at least three feet from anything that can burn. They should be turned off when residents leave the room or go to sleep. Stoves and ovens should, under no circumstances, be used to heat a residence. Any residents that lose power are encouraged to contact their power company; do not assume the company already knows the power is out. If the power goes out, do not run a generator inside the home. "Insulate your home as much as possible," officials said. "Hang blankets over windows and doorways and stay in a well-insulated room while power is out." Anyone looking for shelters and resources during the cold weather can call 211. Exposure to the cold can cause life-threatening health conditions - especially when the temperatures are supposed to hover in the single digits and teens Sunday through Wednesday. With the wind chill each day, temperatures might even feel like they’re below 0 degrees. "Avoid serious conditions, such as frostbite and hypothermia, by keeping warm," officials said. "Wear a hat, hood or scarf, as most heat is lost through the head." Residents who must go outside should cover their mouths with a scarf to protect their lungs. Orange police is urging anyone who absolutely must be on the road to be patient and safe carefully. "It can be difficult to drive behind snow plows as these vehicles usually travel 35 mph or less while they are applying material and scraping snow off the roads," police said. Drivers should remember not to try to pass plows and to keep back at least 200 feet. While on the road, drivers need to slow down, police said. "Driving too fast for road conditions is the main cause of crashes in the winter," police said. "Drive under the speed limit. The post speed limit is for dry, ideal conditions. If it’s wet, snowy or icy, you should be traveling under the speed limit." Following distance should be increased while driving during the snowstorm. Police remind residents that vehicles with all-wheel drive and four-wheel drive don’t, "make you invincible. They help with traction, but they don’t help with stopping and turning." The fire department is reminding resident to clear paths to all doorways because it’s important to have multiple ways out of a home in case of an emergency. Snow around vents should be cleared. "In the event of a power outage, use flashlights not candles," fire officials said. "If you have to run a generator, make sure it is at least 20 feet from your residence and the exhaust is blowing away." Residents should check all smoke and carbon monoxide detectors to ensure they’re working properly. "Make sure you check on elderly neighbors and family members," fire officials said. A parking ban is in effect from noon Saturday through the duration of the storm. Parking is allowed on the odd-numbered side of the street. Airport officials said crews are closely monitoring the weekend storm. "Some airlines have already started adjusting their schedules and, as a result, we are currently seeing a number of flight cancellations for (Saturday) evening," officials said. Those scheduled to travel Saturday or Sunday are advised to check with their airline on their individual flight itineraries. Any potential rebooking options should be explored prior to heading to the airport. Real-time flight status updated are available at www.flybdl.org. Twitter users can receive automated updates by tweeting their flight number @BDLFlightInfo. Heavy snow followed by rain, sleet, freezing rain and plummeting temperatures are expected this weekend. Most of the state is expected to get between 3 and 8 inches of snow, while more than a foot is possible in the northwestern corner, according to the National Weather Service. Areas along the coast, including New Haven and Bridgeport, are expected to get 2 to 4 inches of snow. Snow is expected to begin around 6 p.m. Saturday and intensify around 9 p.m., according to the NWS. The precipitation will turn to rain during the overnight hours and continue into Sunday morning. The rain will end around midday Sunday and temperatures will quickly drop, causing concerns for a flash freeze on the roadways. Temperatures will drop into the teens with wind gusts of more than 30 mph in some areas.